When the temperatures are freezing, there’s nothing better than a hot and hearty meal. Winter is the perfect time to indulge in comfort foods. This one-skillet blend of leafy greens, diced tomatoes, white beans, gnocchi and mozzarella will please everyone in your family. It serves six and takes just 30 minutes to prepare. You have to make the dough and the topping for this savory recipe, but it’s worth the extra effort. The dough is made from potatoes and extra-virgin olive oil, and the topping consists of leeks, thyme leaves, olive oil, white truffle oil and Emmental cheese. It takes about 50 minutes to prepare, and it’s healthy and delicious. 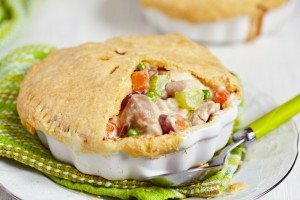 Few recipes exude comfort food more than chicken pot pie. This indulgent recipe features boneless chicken thighs, onion, celery, carrots, thyme, green peas, mushrooms, heavy cream, hot sauce and Worcestershire sauce. It serves four. Soup warms you up almost immediately, and this recipe is sure to become a favorite in your family. It combines butternut squash, carrots, a leek or onion, chicken broth, nutmeg, light cream, and—if you want some extra texture and flavor—toss some toasted pumpkin seeds and/or fresh tarragon sprigs on top.